Apparently it was 20 years ago, on or around 17 April, when a young indigenous, Aboriginal football player made history in a stance against racism both ‘in sport’ and in general. The occasion was a tough match against his team and another which often played ‘grudge’ matches in each calendar year. The atmosphere was electric. Members of the other team were in full throttle. When the young Nicky Winmar and fellow Aboriginal player Gilbert McAdam came out into the oval for the match, some members of the other team addressed the two in a racial slur which embarrassed many team followers. The outcome was that the team Winmar played for won against the other team for the first time in two decades. With the fresh smell of victory in the air, Winmar confronted his opponents followers (standing in their grandstand) whilst still on the field; raised his arms over his head and then began to lift his club top up and pointed to his bare chest. He shouted back: “I‘m black – and I’m proud to be black“. A sports photographer, seizing the moment, captured his gestures on camera and one of his photos became one of those “photos of a lifetime” always to be remembered once published in one of the daily newspapers. New Zealand born street artist Ha-Ha, has recaptured this photographic moment with this stencil. I have seen more than one of these Winmar stencils around town. So, if you see this and wonder its significance, you will now, hopefully, understand the story. 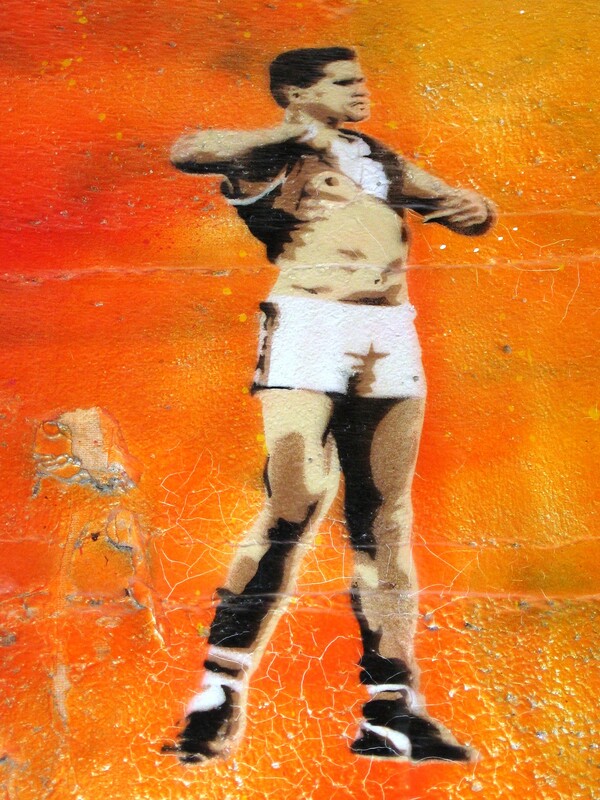 This entry was posted in Stencils, StreetArt, StreetArtists and tagged football, Ha-Ha, Nicky Winmar, stencil art. Bookmark the permalink.